Fleshy red aril surrounding the seeds of Taxus baccata. Many of us were taught in school that one of the key distinguishing features between gymnosperms and angiosperms is the production of fruit. Fruit, by definition, is a structure formed from the ovary of a flowering plant. Gymnosperms, on the other hand, do not enclose their ovules in ovaries. Instead, their unfertilized ovules are exposed (to one degree or another) to the environment. The word “gymnosperm” reflects this as it is Greek for “naked seed.” However, as is the case with all things biological, there are exceptions to nearly every rule. There are gymnosperms on this planet that produce structures that function quite similar to fruits. Cross section of a Ginkgo ovule with red arrow showing the integument. The key to understanding this evolutionary convergence lies in understanding the benefits of fruits in the first place. Fruits are all about packing seeds into structures that appeal to the palates of various types of animals who then eat said fruits. Once consumed, the animals digest the fruity bits and will often deposit the seeds elsewhere in their feces. Propagule dispersal is key to the success of plants as it allows them to not only to complete their reproductive cycle but also conquer new territory in the process. With a basic introduction out of the way, let’s get back to gymnosperms. There are 4 major gymnosperm lineages on this planet - the Ginkgo, cycads, gnetophytes, and conifers. Each one of these groups contains members that produce fleshy structures around their seeds. However, their “fruits” do not all develop in the same way. The most remarkable thing to me is that, from a developmental standpoint, each lineage has evolved its own pathway for “fruit” production. Ginkgo “fruits” are full of butyric acid and smell like rotting butter or vomit. For instance, consider ginkgos and cycads. Both of these groups can trace their evolutionary history back to the early Permian, some 270 - 280 million years ago, long before flowering plants came onto the scene. Both surround their developing seed with a layer of protective tissue called the integument. As the seed develops, the integument swells and becomes quite fleshy. In the case of Ginkgo, the integument is rich in a compound called butyric acid, which give them their characteristic rotten butter smell. No one can say for sure who this nasty odor originally evolved to attract but it likely has something to do with seed dispersal. 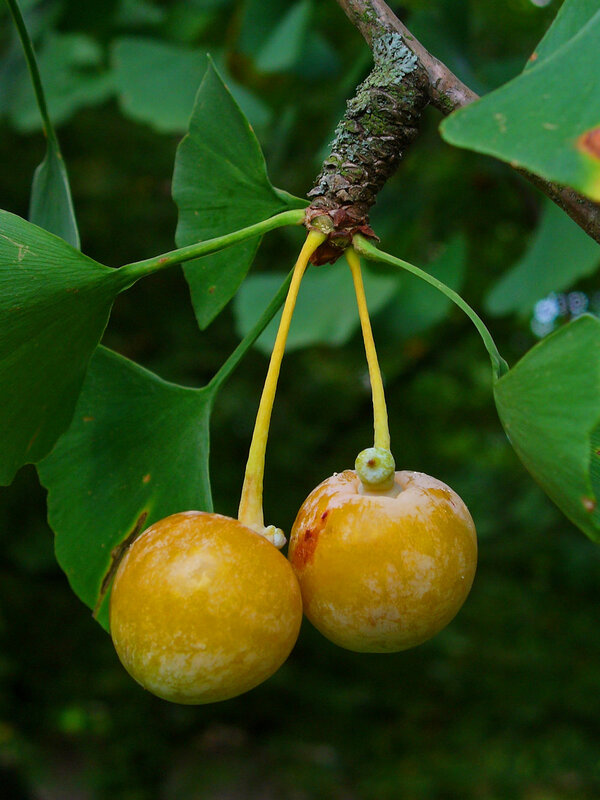 Modern day carnivores seem to be especially fond of Ginkgo “fruits,” which would suggest that some bygone carnivore may have been the main seed disperser for these trees. “Fruits” contained within the female cone of a cycad (Lepidozamia peroffskyana). The Gnetophytes are represented by three extant lineages (Gnetaceae, Welwitschiaceae, and Ephedraceae), but only two of them - Gnetaceae and Ephedraceae - produce fruit-like structures. As if the overall appearance of the various Gnetum species didn’t make you question your assumptions of what a gymnosperm should look like, its seeds certainly will. They are downright berry-like! Berry-like seeds of Gnetum gnemon. The formation of the fruit-like structure surrounding each seed can be traced back to tiny bracts at the base of the ovule. After fertilization, these bracts grow up and around the seed and swell to become red and fleshy. As you can imagine, Gnetum “fruits” are a real hit with animals. In the case of some Ephedra, the “fruit” is also derived from much larger bracts that surround the ovule. These bracts are more leaf-like at the start than those of their Gnetum cousins but their development and function is much the same. Red, fleshy bracts of Ephedra distachya. Whereas we usually think of woody cones when we think of conifers, there are many species within this lineage that also have converged on fleshy structures surrounding their seeds. Probably the most famous and widely recognized example of this can be seen in the yews (Taxus spp.). Ovules are presented singly and each is subtended by a small stalk called a peduncle. Once fertilized, a group of cells on the peduncle begin to grow and differentiate. They gradually swell and engulf the seed, forming a bright red, fleshy structure called an “aril.” Arils are magnificent seed dispersal devices as birds absolutely relish them. The seed within is quite toxic so it usually escapes the process unharmed and with any luck is deposited far away from the parent plant. The berry-like cones of Juniperus communis. 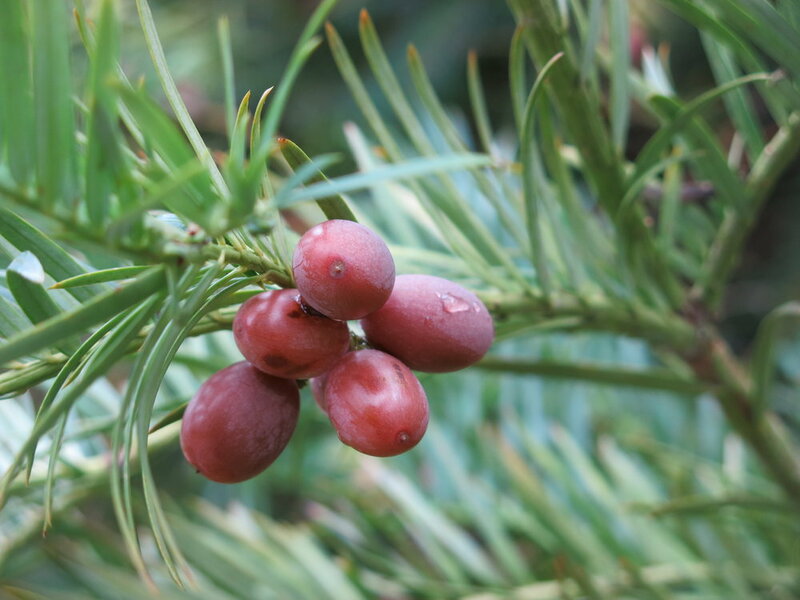 Another great example of fleshy conifer “fruits” can be seen in the junipers (Juniperus spp.). Unlike the other gymnosperms mentioned here, the junipers do produce cones. However, unlike pine cones, the scales of juniper cones do not open to release the seeds inside. Instead, they swell shut and each scale becomes quite fleshy. Juniper cones aren’t red like we have seen in other lineages but they certainly garnish the attention of many a small animal looking for food. I have only begun to scratch the surface of the fruit-like structures in gymnosperms. There is plenty of literary fodder out there for those of you who love to read about developmental biology and evolution. It is a fascinating world to uncover. More importantly, I think the fleshy “fruits” of the various gymnosperm lineages stand as a testament to the power of natural selection as a driving force for evolution on our planet. It is amazing that such distantly related plants have converged on similar seed dispersal mechanisms by so many different means.